Well, to create the best email signature design one needs to know how to pick out the color scheme, to select fonts and overall how to balance signature lines for the best email footers. 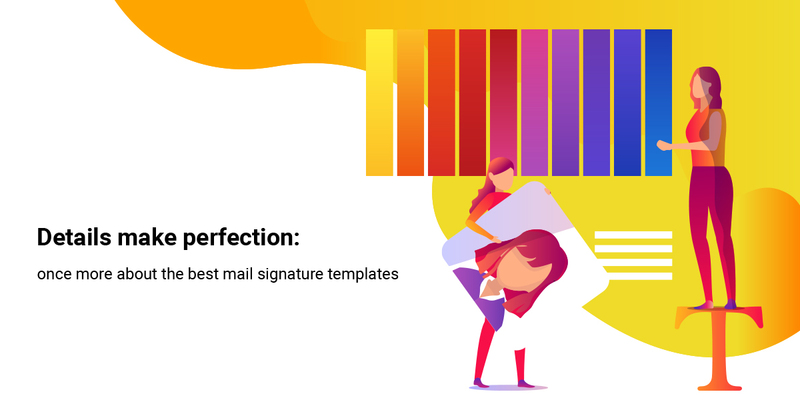 What a relief that you can actually entrust this highly sensitive mission to professionals like MySignature and set an email footer using the best professional email signature templates created by our designers. However, even with such services, some people manage to mess up the building up of their mail signature. In previous articles, we have already discussed the basic DOs and DON’Ts of creating the best email signature examples. Let’s revise some of them using the signature of some girl named Jane Collins and pinpoint her mistakes. What is the first thing that catches your eye when you are looking at any email signature? It is the photo of course! Some people do not use photos in their email signatures at all and they are definitely missing out! The photo is a must if you want to create the best email signature design possible. People long to see who they are dealing with. Obviously, Jane’s photo is a poor choice. Her face is not visible at all (remember that your face should always be visible at photos, even sunglasses or hats with a wide brim are not acceptable). Naturally, it is possible sometimes to place a logo in your signature instead of a photo or a photo of your product for example, although people will definitely remember the face better than some random picture. With Jane’s photo, the first guess is that she probably is a hat store owner or something like that, although she is, in fact, a senior accountant at West Labs Inc. according to her signature. The second flaw of this email footer is, of course, its tremendous variety of social media icons. We see that Jane is VERY social; one might wonder how does she even manage to do her actual job being so active on the Internet? Even if you do have many social media profiles, we would recommend keeping it simple and add maximum three or four of those. Then, Jane definitely added more than enough of her contact information. From the signature, we know her telephone numbers, her website, her Washington address, and her skype. She even made sure to mention her email address, which people can actually see without the footer. That’s our third mistake: do not cram unessential information into your signature. The best signature lines for emails would be those that bring some new and useful info. Nevertheless, nil desperandum! After the Big Makeover Jane’s email signature looks more professionally. As you see, we now have the chance to look at her face that has a very nice open smile what is always alluring to customers and partners! The number of social icons was dramatically reduced down to just three of them. We have also changed the overall design: before it was too bright and even a little bit garish and now its new template looks more solid and professional, what is more suitable for the business sector. By the way, both email signatures were created using MySignature generator that has the best email signature templates for every taste and for every platform. Yeah, that’s right, here is one more problem that you can experience while creating your best professional email signatures via other services. Sometimes the template you created for Gmail.com or another mail platform would not look quite the same in the footer of Outlook’s client, for example. Compatibility considerations are not the issue with MySignature, their email footers are tested to work in all email clients. Thus, the best outlook signatures can be generated on this platform alone! Previous PostPrevious How to Design an Eye-Catching Email Signature?